In the LINK-GIS map viewer, hover on the gray box with white stacked squares on the upper right of the viewer. The hover text reads “More Layers”. When clicked, it expands, showing several groups of map layers that can be turned on and off. The flood zone layers are on by default, but will not appear until zoomed in several levels on the map. The flood zone layers for Kenton, Campbell and Pendleton Counties are in the “Zoning and Flood Layers” group. To expand the “Zoning and Flood Layers” group, click on the gray triangle on the left side of the group name. 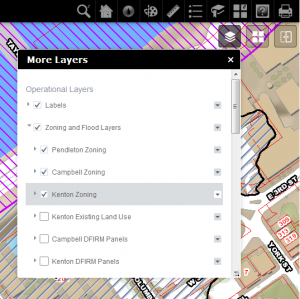 Scroll down, using the scroll bar or mouse wheel, to find the flood zone layers: “Kenton Flood Zones”, “Pendleton Flood Zones” and “Campbell Flood Zones. To turn a layer on, check the box next to the layer name. Also, make sure the box next to the group name is checked as well. Uncheck the box next to a layer name to turn it off. Click on the black and gray triangle on the right side of a layer group to set transparency for the layers in the group. About 25-35% transparency is recommended for viewing the flood zone layers. It is also recommended to view the flood zone layers on top of the “Aerial” basemap to see if structures are in or out of a flood zone.